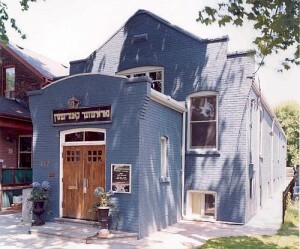 In the early days of the First Narayever Congregation, the members met in a house on Dundas and Huron. It was not until 1940 that the congregation was able to afford a more permanent building for their synagogue. Rather than constructing a synagogue, they invested in a building on Brunswick Avenue, which was within walking distance from most members’ homes. The area around Brunswick Avenue was at that time, and remains today, mostly residential. The First Narayever’s structure fits in nicely with the residential houses in regards to its size and stature; it is a humble synagogue with a warm, welcoming facade. The only distinctive difference between the Synagogue and the surrounding houses is the Yiddish writing “First Narayever” located above the front doors. The First Narayever synagogue was originally a red brick building with a pitched roof and a few small windows. Today, the brick is painted a greyish blue, but the exterior remains otherwise unchanged. Its design is not typical for a synagogue, as it was originally built as a Foresters Lodge and later served as a Mennonite church. It is a very modest structure with little ornamentation. The building is over a hundred years old. As a result, due to its size and age, it differs dramatically from the newer and vastly larger synagogues that have been erected in Toronto recently. The First Narayever Congregation began renovating the building in the 1980s. Originally, the building was not equipped to accommodate social events due to its size. The renovations therefore involved turning the basement into a kitchen and social hall. Also, the bimah—the raised platform that faces the ark where the prayers and Torah reading are led—was acquired and now occupies the centre of the Synagogue, replacing the podium that was once used to hold the Torah. Before the transition, there was a wooden divider, called a mechitza, at the back of the pews to separate the women from the men; however, it was removed during the 1980s when the congregation officially became Orthodox egalitarian. Other changes to the interior include a new curtain over the aron kodesh—[literally, “holy cabinet”] ark in which the Torah scrolls are kept—decorated with a mural of a tree and several candelabras on the corners of the bimah, which lend the sanctuary a warm and pleasant atmosphere. The Synagogue’s interior is in keeping with the building’s humble design. The sanctuary is narrow and simple in appearance, with white walls and a stippled ceiling. The walls, lights, pews and windows are all unadorned with little ornamentation, although pleasant and elegant in appearance. The aron kodesh occupies the central area of the room at the front; it is framed by two square fluted columns. Over the arch is a passage from Hallel—[literally, “praise”] prayer composed of different Psalms that is recited on the first day of new months and on certain holidays—and underneath the Ten Commandments are depicted on stone tablets. On either side of the Ten Commandments are carved lions symbolizing Jerusalem.